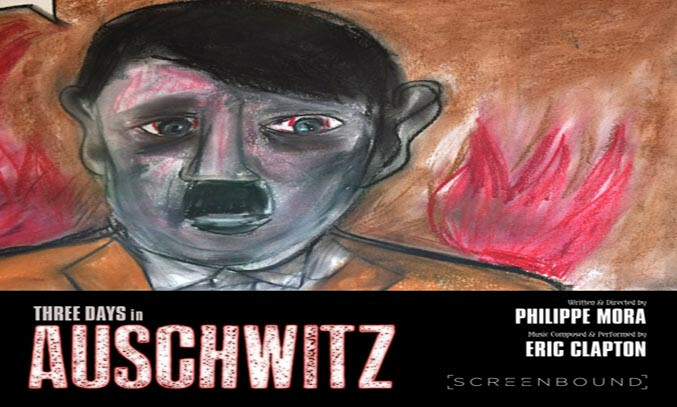 For a film with a title inspired by Mora’s three visits to the site of Auschwitz-Birkenau between 2010 and 2015, we don’t actually see a great deal of these visits; we even witness an Auschwitz tour guide informing Mora that filming is not allowed, thus suggesting that footage we see of the present day camp had to be shot quickly when opportunities presented themselves. Outside of the camp, we follow Mora from Los Angeles to Melbourne to memorials and museums in London and Berlin; fairly devoid of interest, these sections show Mora travelling on the Underground, capturing footage of the Holocaust Memorial on his phone and his being prohibited to record at the Imperial War Museum. Though footage of Mora’s family feels self-indulgent and in keeping with the overall feel of a video dairy, his Mother Mirka’s story involving an unstamped letter flung desperately from a Holocaust train, resulting in her release from Pithiviers concentration camp one day before transportation and certain death at Auschwitz, is an undeniably powerful moment. Outside of the film’s struggles to teach us something new, nuggets of interest do emerge: the oft-ignored genocide of an estimated 1.5 million Armenians between 1915-6 is cited as a forerunner of the Nazi genocide and we learn of a Polish eye witness who suggested that SS guards were only able to enact such tremendous evils through being anaesthetised and always “out of it” on vodka. Also interesting, and a unique selling point with which this film will garner attention it would otherwise fail to achieve, is that Eric Clapton, a long-time friend of Mora’s, has written and recorded the film’s score. Featuring pensive finger picking, subtle leads and muted wah-wah set intermittently to heart swelling strings, Clapton’s playing is competent as one would expect; of course, the task of capturing a felicitous evoking of such horror is as good as impossible. Though created over a five year period, ‘Three Days in Auschwitz’ still manages to suffer from a sense of being rushed and certain moments are undoubtedly ramshackle in the context of a film set for commercial release. While stood at the site of Hitler’s former Chancellery in Berlin, (now a Chinese restaurant) Mora mistakenly reproaches his cameraman for not utilising the audio function and the cameraman responds in kind. Elsewhere, Mora’s speech becomes nearly indecipherable when he walks away from camera in the middle of describing the pre gas chamber scenes at Auschwitz. Never providing much in the way of interest, Mora’s film hardly ceases to feel like a slight eavesdropping on a family’s home video. If the project has afforded Mora a form of exorcism and his progeny a document that supports a less abstract grasp on the horrific crimes perpetuated by Nazi Germany, then it has been worthwhile one. As a commercial release though, it has little value. Tagged documentary, eric clapton, philippe mora, review, three days in auschwitz. Bookmark the permalink.